Summary: The Talbot Islands State Parks are responsible for protecting and monitoring approximately 7.6 miles of Florida coastline. These beaches provide important nesting habitat for three species of sea turtle: loggerhead (threatened), green (endangered), and leatherback (endangered). 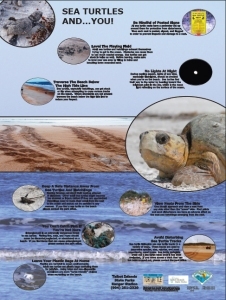 Due to ever shrinking populations of nesting females it is imperative that the Talbot Islands beaches continue to be monitored and protected in regards to sea turtle activity. Education is a big part of the parks' sea turtle protection and monitoring. These parks offer the public 6 interpretive programs per year, 2 kiosks, 5 different interpretive brochures, and several identification posters. This project will support updating and resupplying current interpretive materials in use at these parks. Results: Overall, seven sea turtle kiosk panels were made, 5,000 sea turtle brochures were printed, and 4 sea turtle skulls (representing different species) were purchased for interpretative programs.